Another budget Ray Winstone film this that I caught recently - also starring Jude Law and a two Minder related boats, namely Ray and Mark Burdis. It also stars Sadie Frost, Holly Davidson (she played a WPC called Roz in 'The Bill', John Beckett, Perry Benson, Lisa Marsh and William Scully. I must confess, I didn't like much about this film at all - essentially, everybody (in what initially seems like a group of friends) seems to play a character with their real name and the whole thing is set at Jude's wake. Jude's girlfriend Sadie tells them all that it was Jude's final wish that he play them a film he's been making. We only see Jude in the film as the others all gather round to watch. As the group sit down they soon realise the film they are watching is all about them as Jude exposes them to be two-faced deceitful liars with absolutely no loyalty for one another. The film that has been made - well Jude has been secretly filming them all in and around his house (bathroom, bedroom, living room and around the neighbourhood), also actively turning some of them against each other to see how they react, provoking a reaction from them as he clearly deep down doesn't really like them (I can only aasume). Jude himself soon turns out to be very much like the people he is exposing, a pretty nasty person with bad intentions. 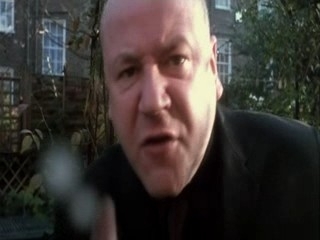 There are a lot of four letter expletives in this film, as Winstone's character explodes as he is exposed. There is a nice little twist at the end of it but overall I think the film falls flat on its face as the idea soon runs out of steam. A film full of people you hate is something that just doesn't flick my switch. It is a little too predictable too after a while and the lack of action (apart from the last 5 minutes) means it is a slow dialogue filled piece from start to finish. The only real positives to take from this is that you see bread and butter British actors all working on a low budget British flick PLUS the fact the horrible folks they are - it is sort of poetic justice seeing them get their comeuppance by the end of the film. I have never been a fan of Jude Law and for me he seems a massively overrated actor. His part in this was the same blah blah role he always he seems to play. 3/10 - this is a poor film in my opinion and only one step away from an avoid. At two points I thought I was about to turn it off through sheer boredom and the switching to Jude's filmed inserts every 5 minutes reminded me of 'The Blair Witch Project', only that was much better. Very little location filming in this but there are some street scenes in 90s London. At the end of the day though, it's a very weak film and Winstone is way too OTT cockney-geezering it up every 5 minutes and dropping in F words and C bombs way too often.